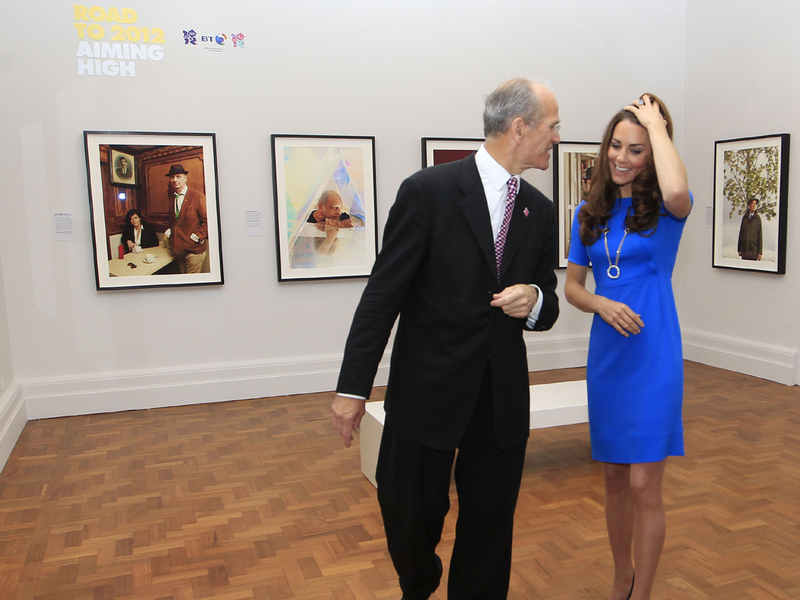 (CBS News) Kate, Duchess of Cambridge, visited the Road to 2012: Aiming High exhibition at the National Portrait Gallery in London on Thursday. The exhibition features newly-commissioned photographic portraits of Olympic athletes. According to the U.K.'s Daily Mail, while there, Duchess Kate also took in the museum's Diamond Jubilee Exhibition on The Queen, Art and Image. Welcomed by dignitaries, including Dame Tanith Grey-Thompson, Kate wore a blue Stella McCartney crepe dress, priced online at approximately $809. The dress description notes: "This simple shift embodies easy luxury with its minimalist silhouette and eye-catching bold hue." Kate, 30, polished it off with a gold chain necklace, featuring a circular pendant, and a pair of black kitten heels. Prince William's wife kept with the London Olympics theme, both by sporting vibrant blue and by wearing a frock by McCartney, who's also the designer of Great Britain's Olympic uniforms. Kate's appearance sparked the latest round of online pregnancy reports. As she always does, Kate held her hands by her stomach, prompting even more baby rumors. The Daily Beast pointed out the "fullness" of Kate's figure on Thursday, for example. Since last summer, speculation about a royal baby has become something of a national pasttime. So far, the reports have not amounted to anything. You can look at the pictures hereand decide for yourself. This Portrait Gallery visit marks one of the many Olympic-related events Kate will take part in over the next several weeks.